In the fall of 2010, Jackie and I were with an archaeological group at the Hopi Mesas. We met many of the elders and became interested in the way they have grown their corn for over a thousand years. It occurred to us that it would be something we could try at Rosedale. I ordered blue corn seed from Seeds of Change. 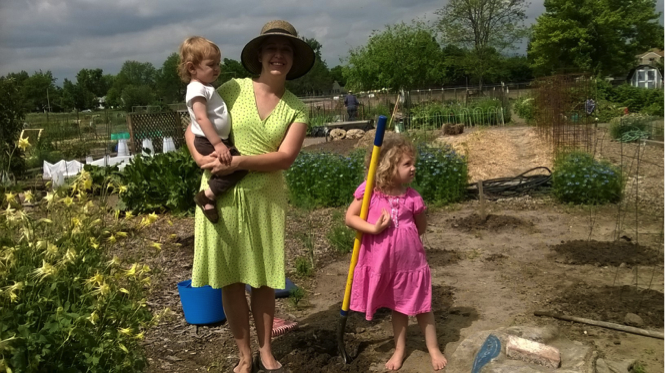 We read about the traditional methods of planting, and when the weather seemed right at the end of May, we began. Each hole was dug and organic material added. 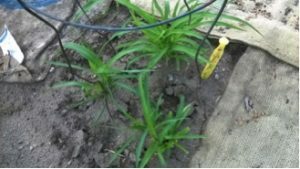 With a stick, a hole was made 12 inches below the surface and seed dropped into it and tamped down. We moved four paces and planted the next hole. We had been warned not to water, but to wait for rain. We set up a little shrine with a picture of a katsina tacked to a pole. Our Hopi friend, Donald, agreed to give a long distance blessing to our project. 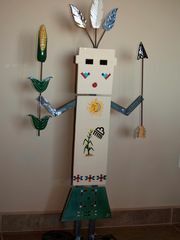 He told us that in order for the corn to prosper, we needed to dance and sing amongst the rows. Since neither of us dance or sing, we found Colleen at the garden willing to sing. She has a beautiful voice and sang a lullaby to the corn. It was very touching, especially since she was pregnant at the time. I had tears in my eyes. Hopi corn geminates from the moisture deep down in the hole. We began to see little green shoots. As the summer progressed and the rains came (more than they would have at Hopi), the plants were beautiful. Soon we could see evidence of ears appearing. We were almost dancing in the patch! Soon, they were mature enough that we could peek and see blue color. We kept Donald informed of the progress and sent him photos by email. He was pleased and very encouraging. Finally, it was time to harvest our crop. We had such beautiful ears. Some were sapphire blue and some looked like garnets. We kept a few to use for seed this year along with the commercial seed we used last year. The best ones we send to Donald and to our friend, Tessie, at Santa Clara pueblo. Upon receiving the package, Donald responded that it was a very sacred time at Hopi and he was about to go to the kiva for religious ceremonies. Our blue corn would go with him. 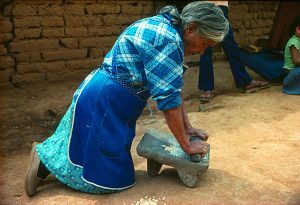 Tessie wrote us that she will grind the corn we sent her—by hand, using a mano and metate and will sprinkle the corn meal as blessings. After harvest, we bent the stalks over in the Hopi way so that they could rest. We found out that according to tradition, the stick used to make the 12 inch holes should be left in the patch to give strength to the crop. We will do this when we plant this season. Rosedale’s influence, through our experiment, has been extended all the way to Arizona and New Mexico! 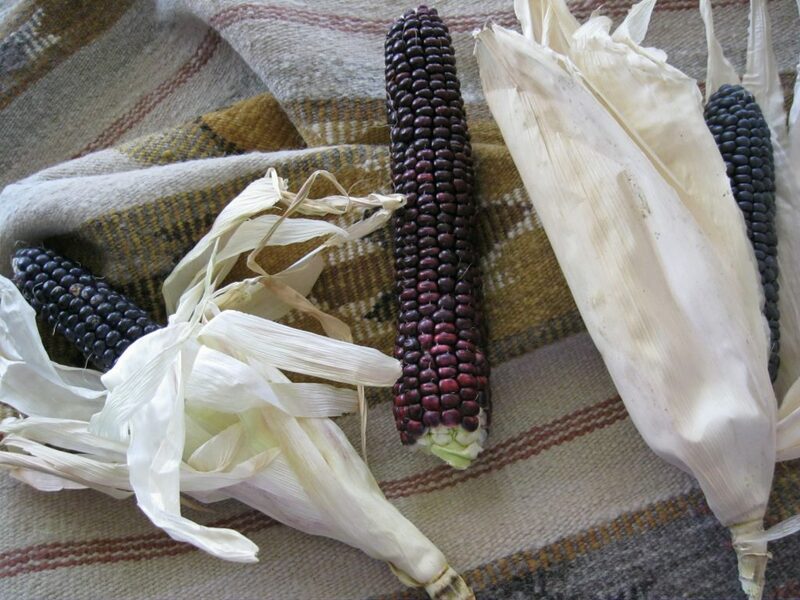 On June 15, 2015 we planted the Hopi Blue corn seed that I bought from Janice Day on Second Mesa in Hopi. Other years we have used a few different types of seeds. However a Hopi elder tole me that was not a good idea and perhaps why some of our ears last year didn’t have any color. Using a stick, Jackie made 3 holes 14 inches deep in each of 6 hills. We put in each hole 2 seeds for the Katsina, 2 for Mt Evans (since we can’t see any of the Hopi sacred mountains), 2 for the mice and 2 for us. The ground temperature was 70 degrees and very wet. On June 22 we saw the first blades coming through the ground – only 7 days and it came up 14 inches! On June 25 we had a heavy hail storm. The corn survived though many of the leaves showed signs of being shredded. The pounding and the cold couldn’t have been very good for it. Today is July 11 and the corn is well below “knee high”. We have had some hot days but also some very cool rainy ones so it is not surprising that the corn, though growing, is not flourishing.